furniture grade, (UV protected) 1" 4 ways, "pvc side outlet T's." Slip all four ways. Used for many construction projects. Beveled Outside Edges. 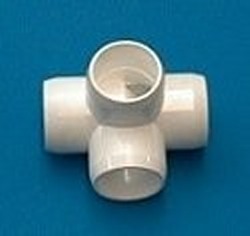 Not a NSF rated fitting, cannot meet require plumbing inspections, and it is NOT a flow thru fitting, but you could cut out the molding obstruction, however it would not be easy.